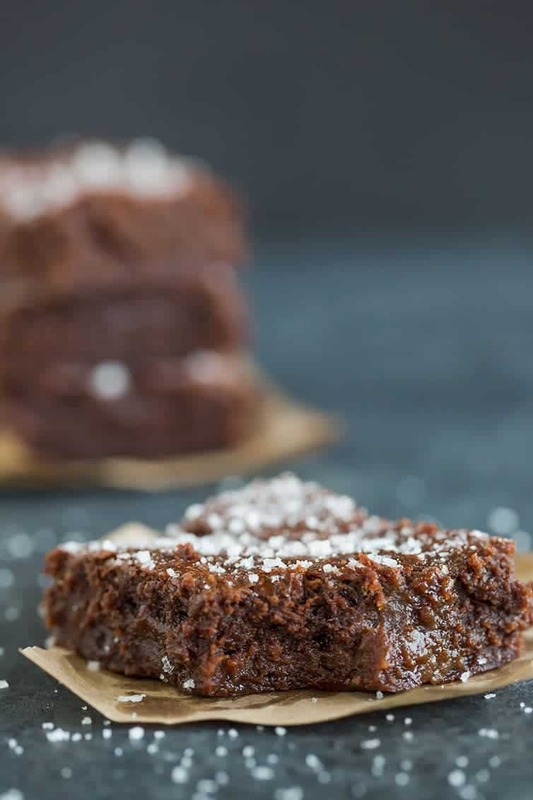 These are the ULTIMATE salted caramel brownie! 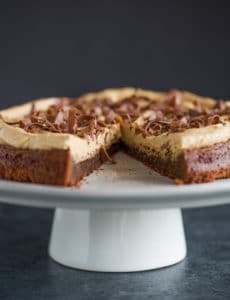 The batter from the super popular Baked brownie is used, with a layer homemade salted caramel baked right into the middle. Sprinkled with fleur de sel and coarse sugar, it’s a sweet/salty lover’s dream! When my husband and I first started dating, he was living and working outside of Washington, DC; we did the long distance thing for about three years before he packed up and moved back home to Pittsburgh. We would visit each other on weekends, and going out there always felt like little mini-vacations. We found so many fun things to do, and one of our favorites when the weather wasn’t too sweltering was going to the Leesburg Outlets to walk around and shop. During one of our shopping trips, I happened upon a sidewalk sale that had a massive stack of Baked Explorations cookbooks on clearance. It is the second in the Baked cookbook series (you know, the book that brought us the Baked Brownie and Root Beer Float Cake, mmm!). I snatched it up, and couldn’t wait to get in the car to start browsing through it. These sweet and salty brownies jumped off the page at me, and I knew immediately they would be the first thing I’d bake from the book. All these years later, I’m still so happy I made that decision because if you’re looking for salted caramel brownies, look no further. These are THE BEST. 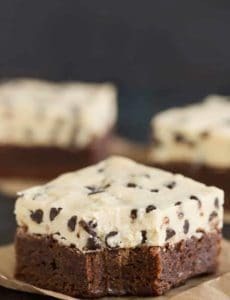 These brownies are a take on the fabulous Baked brownie, which are dense, fudgy and the most delicious brownie I have ever had. This recipe slaps a layer of salted caramel in the middle and then sprinkles a combination of fleur de sel and coarse sugar on top. I had previously made salted caramel brownies where I swirled the caramel into the brownie batter, but the salted caramel in these brownies are baked right into a middle layer, so it essentially becomes part of the brownie batter. 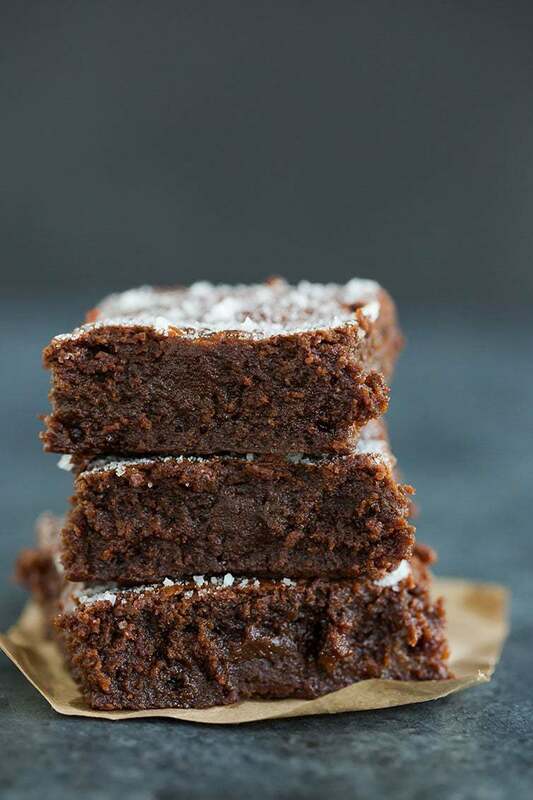 You can definitely taste it in there and the saltiness it imparts, along with the salt sprinkled on top, is a wonderful balance to the sweet richness of the brownie batter. These are definitely killer salted caramel brownies. The salted caramel trend has been around for quite a long time now, and I don’t foresee it going anywhere anytime soon, so might as well hop right on that bandwagon, whip up a batch of salted caramel sauce, and make these babies. 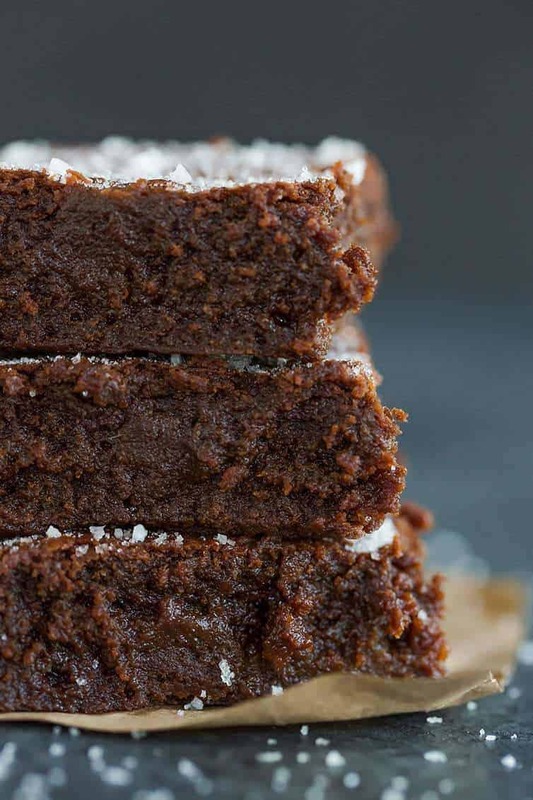 These are the ULTIMATE salted caramel brownie! The batter from the super popular Baked brownie is used, with a layer homemade salted caramel baked right into the middle. Sprinkled with fleur de sel and coarse sugar, it's a sweet/salty lover's dream! Make the Salted Caramel: In a medium saucepan, combine the sugar and corn syrup with ¼ cup water, stirring them together carefully so you don't splash the sides of the pan. Cook over high heat until an instant-read thermometer reads 350 degrees F, or until the mixture is dark amber in color (keep a close eye on the caramel at all times, as it goes from golden brown to black and burnt very quickly), 6 to 8 minutes. Remove from the heat, and slowly add the cream (careful, it will bubble up) and then the fleur de sel. Whisk in the sour cream. Set aside to cool. Make the Brownie Batter: Preheat oven to 350 degrees F.
Butter the sides and bottom of a glass or light-colored metal 9x13-inch pan. Line the bottom with a sheet of parchment paper, and butter the parchment. Assemble the Brownies: Pour half of the brownie mixture into the pan and smooth the top with a spatula. Drizzle about ¾ cup of the caramel sauce over the brownie layer in a zigzag pattern, making sure the caramel doesn't come in contact with the edges of the pan or it will burn. 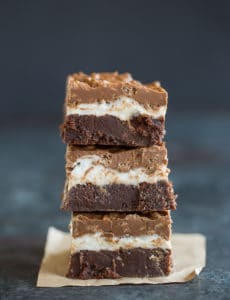 Use an offset spatula to spread the caramel evenly across the brownie layer, leaving about a ½-inch border around the edges. In heaping spoonfuls, scoop the rest of the brownie batter over the caramel layer. Smooth the brownie batter gently to cover the caramel layer. Remove the brownies from the oven and sprinkle with the fleur de sel and coarse sugar. Cool the brownies completely before cutting and serving. The brownies can be stored in an airtight container at room temperature for up to 4 days. They also freeze extremely well! You will not use all of the salted caramel sauce for the brownies; store the remainder in the refrigerator for drizzling on ice cream (or eating with a spoon). Use within 2 weeks. You can use your favorite homemade salted caramel sauce, or store-bought, if you'd prefer. BONUS! You get a little leftover salted caramel sauce to keep in your fridge for emergency situations! This recipe was originally published on June 7, 2011. I’m ashamed to say that I’ve never had sweet and salty brownies! This recipe looks great though so hopefully that will change! Thanks for posting it, Michelle! I love your blog and using your recipes, but I was really in love with the previous caramel brownie recipe…much more than this one. Is there any way you can send me that previous recipe? salted caramel sauce after add the cream for caramel its no need to cook again ? Correct, after you add the cream you do not need to continue cooking. Wow, this sweet and salty brownies look gorgeous. I made it a short while ago and it was lovely, in fact have made it again since. It is very decadent, and the people in my office are happy today! I often use Greek yogurt instead of sour cream when baking. Do you think that would work for this salted caramel sauce? Hi Renee, I haven’t tried that substitution so I couldn’t say for sure, but it should work fine! 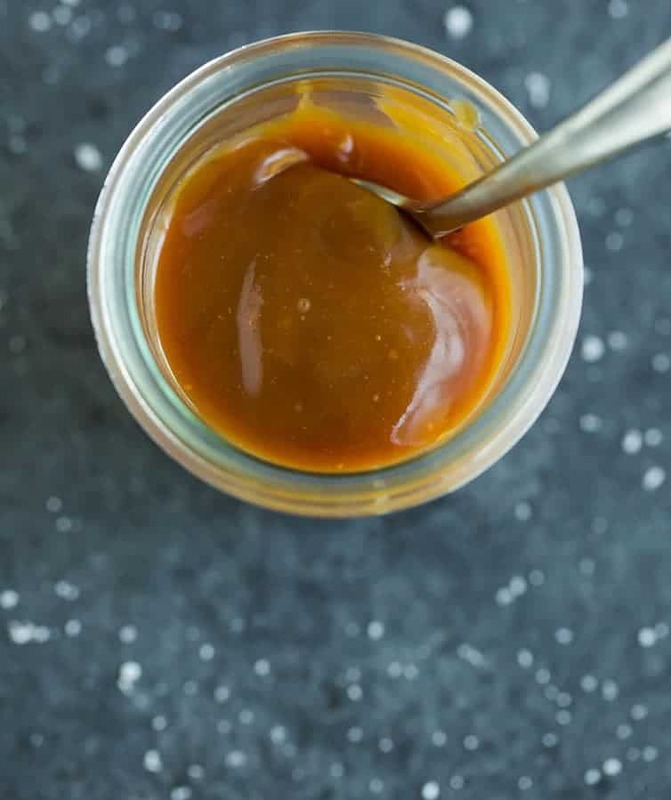 Do you follow this caramel sauce recipe exactly? My version from Rachel Rae says use heavy cream or half and half so i use half and half. I’ve made it 3 times and 2 of those 3 it comes out gritty and separates so that I have to stir before using. What could it be? Hi Aggie, Yes, I follow this caramel recipe exactly. I’ve never made the Rachel Ray one, so I couldn’t say for sure what the problem is, but if it’s gritty, it sounds like the sugar hasn’t completely melted/dissolved. YUM! This is my go-to brownie recipe. I make these all the time! I usually leave out the caramel because I tend not to have sour cream on hand, and they’re still divine! This is incredible! How have I never thought of a sweet and salty brownie? Sorry Michelle I pressed wrong place — I would like to make those scrumptious Sweet&Salty Brownies & have no idea what ‘fleur de sel is , can you help me? Thank you bunches! Hi Michelle, I’m new to your recipes (wrote to you when I joined a month or so ago). I also am a “Pittsburger”, now in New Eagle, right next to it. These just look so ooey gooey delicious! What an inspired and yummy treat, can’t wait to try. On another subject, I used to live in Pittsburgh and was there again for a visit a week ago, and now I miss it. People are friendly, and traffic (apart from 28) is decent, and I can park everywhere… I love reading your blog and seeing not only the recipes but also hearing about my old neighborhood. Anyway, thanks for all your posts and enjoy summer with your beautiful boys! Loving your blog and recipes.. So glad I found you. These look amazing, I’m a sucker for sweet and salty! They look fabulous but can I substitute honey for the corn syrup and still have it turn out? Hi Judy, I’ve never used honey in caramel sauce, so I’m not sure how it will affect the sauce’s texture. Have made these a few times (I also have their books) and I’m always afraid that they’re underbaked because they’re soooo fudgy. And again, I sit here drinking my coffee having just cut another batch and was worried – then I saw your photos and they look EXACTLY like my brownies. Phew…finally a reference point! I actually like more cake like brownies rather than fudgy. Is it possible to add baking powder or salt to make it that way? If so, how much should I add? Hi Nancy, I would not recommend doctoring the recipe to make a more cake-like brownie. These are definitely formulated to be fudge-like. I would recommend searching for a cakey brownie recipe instead. IT LOOKS REALLY VERY YUMMY ND TASTY. These were just incredible! Thanks for sharing the recipe!